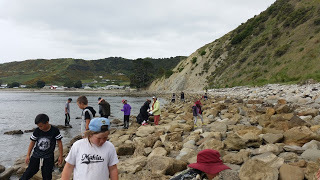 The journey of crayfish started in the sea but our day started down at Whangawehi as we waited patiently for the boat Aurora to come and dock down in the Jetty. 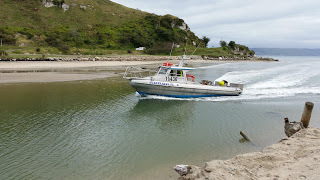 Skippered by Selwyn and his crewman Tom they pulled into the jetty with baskets full of crayfish. 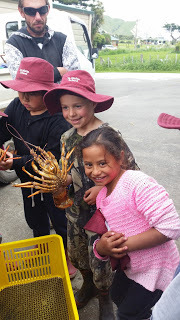 The tamariki got a close up look of the crayfish in their baskets. 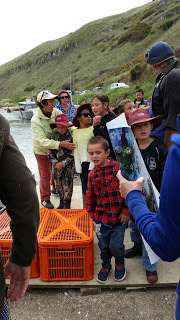 Both our journey and the crayfishâ€™s journey carried on to Mahia Beach as we trailed behind Selwynâ€™s truck that carried the sea creatures. We got to view the holding pools where the crayfish were transferred into from the truck. Yvette weighed the catches in their baskets before they were put into the pools. The water in the holding pools had to be around 11 degrees to keep the crayfish from getting distressed. No more than 12kg of crayfish were put in each basket allowing room for the crayfish to move around. 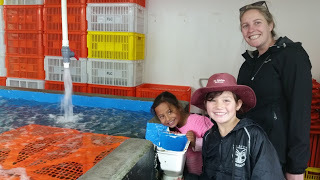 The holding pools that we viewed could fit up to two tonne of crayfish but the truck that transports them out of Mahia canâ€™t hold as much crayfish therefore the number of trips per week varies. When the crayfish are delivered to the depot in Masterton or Wellington they are graded A, B, C or D based on their size. Crayfish are then exported to other countries and are put into special chilly bins to hibernate. The temperature inside the chilly bin is lowered in order for the crayfish to hibernate and sleep. When the crayfish arrive at their destination the temperature in the chilly bin is increased resulting in the crayfish waking. Majority of the crayfish that leave our shores are exported to Asian countries, one in particular is China. 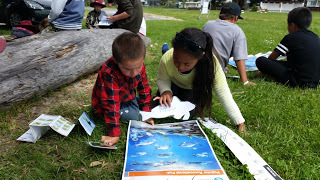 We all had an amazing day learning about crayfish. 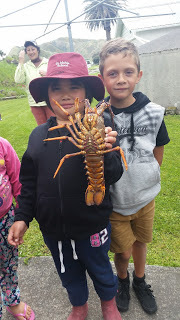 The tamariki also held a crayfish and loved posing holding them. We learnt interesting facts about crayfish and crayfishing too. A female crayfish has fins on the inside of its tail and that is where the eggs are kept. Around the beginning of October is when female crayfish start dropping their eggs. 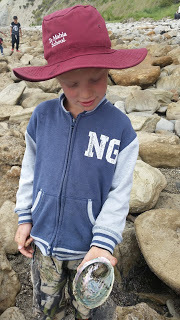 Two of the most important facts the children were told is you cannot take crayfish with eggs, and the legal size in which you can take a crayfish, is it has to measure at least 60mm across the tail. Thank you Selwyn, Tom and Yvette for sharing your experiences and knowledge of crayfish, crayfishing, storing and exporting crayfish, and also to the crayfish where none were harmed in our journey!